Donny (Derek Hough) is an ex-con hoofer trying to make a living tap dancing for tourists on the streets of New Orleans. After his parole officer gives him a hard time, basically telling him to get a real job, Donny flees to New York to hook up with his foster brother Nick (Wesley Jonathan), who is the proprietor of a hot underground dance club in Brooklyn called Static. Donny thinks maybe he could get a job dancing there, make some real money. He walks into a complicated turf war, between Nick and his former partner Kaz (Will Yun Lee). Kaz stole some ideas, and then branched out on his own, opening his own rival dance club. Things have gotten ugly. Donny doesn't care about any of that, he just wants to dance! Written and directed by Duane Adler, who wrote the screenplay for the original "Step Up," "Make Your Move" has a pretty complicated plot, involving corporate sponsorship, event planning, career moves for dancers, visa and immigration issues, not to mention various family dramas and burgeoning romance. It's a lot to absorb. But a movie like "Make Your Move" rests on the success of its various dance sequences, not its plot. And the dancing here is exciting, innovative, and specific. Each "number" has a story behind it, a motivation, a different look and feel. Adler and his cinematographer Gregory Middleton chose to film much of the sequences using full-body shots, the camera moving with the dancers, giving us a chance to see the dancers in action, moving through space. Oftentimes, with dance movies, the camerawork and editing choices cut away from the full body, showing us different parts and gestures, trying to generate a sense of excitement and movement through the editing. It can be frustrating, especially if you grew up watching Fred Astaire and Ginger Rogers: "Let me see the whole dancer!" "Make Your Move" shows us the whole dancer. These sequences really move in a way that feels organic. Donny almost instantly gets a crush on Aya (played by South Korean pop singer BoA), younger sister to Kaz. Aya dances with an all-girl group called the Cobu Girls, and their choreography is a combination of Japanese Taiko drumming and Broadway tap dancing. Aya is caught in the middle of the war between her older brother and Nick, and her problems are exacerbated by the fact that she will be sent back to Japan in three weeks if she doesn't get some kind of gig, and soon. She and Donny meet one night at Static, and end up doing an impromptu tap-dance battle along the top of the bar. That dance is when the film really kicks off. Both dancers are not only superb athletes, but committed to the moment underlying the dance. It's a flirt, it's a mating dance, it's a competition, both of them pushing each other on to better moves. You get a true sense of the enjoyment they get from dancing with one another. It's infectious. Despite the increasing violence between the two clubs, Aya and Donny strike up a sweet and tentative romance. Nick and Kaz try to intervene, and it's all quite Montague/Capulet at times. Aya's future is so uncertain, she's not sure she wants to get involved, and Donny takes that "No" for an answer, but asks if they could please dance together again at least? The film understands what dance means to those who live and breathe it. There's a real feeling of pleasure and excitement when you find your "partner," someone who pushes you to be better, who can read your moves ahead of time, who can move with you. I could have lived without the choreographed (literally) foreplay scene, as they dance their way to the bed, but there are other dance sequences between the two where their chemistry vibrates off the screen. Derek Hough will be familiar to fans of "Dancing with the Stars," and when he is allowed to let loose here and really show what he can do, he is an absolutely thrilling performer. And BoA, whose fame is enormous in Japan, is wonderful, bringing ambition, humor, and smarts to her character. You like them both. 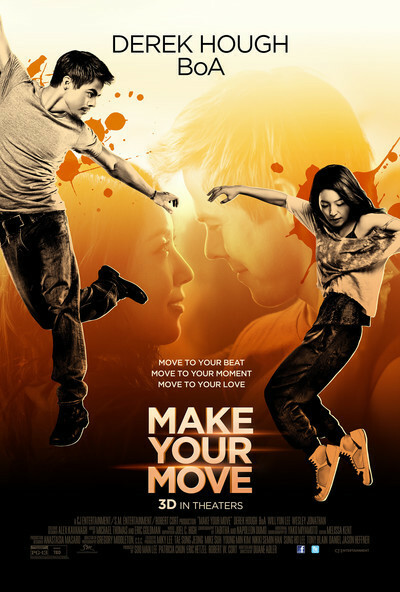 "Make Your Move" has an underlying sweetness that serves it well. It understands the need for community, for expression, for family. It's kind to its characters. It features a diverse cast, accurately reflecting the dance world and its inhabitants. Adler and Middleton know that when we come to a dance movie, we want a chance to see, really see, those dances. They find a way to do just that.